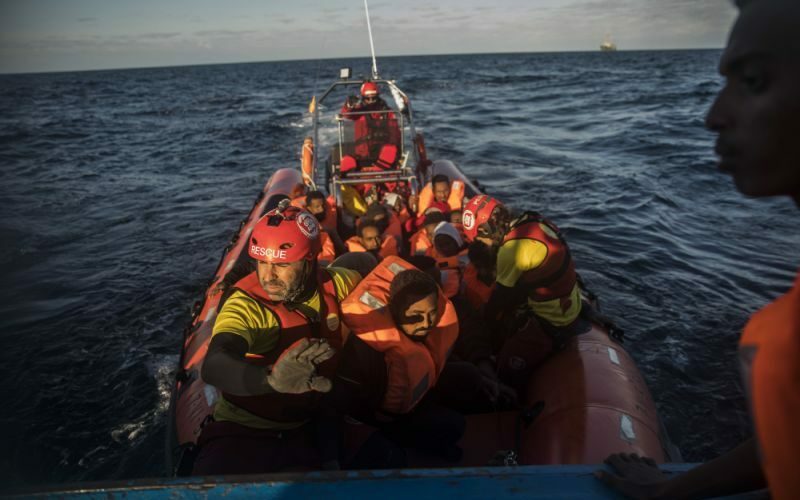 AID workers on a boat seized by Italian authorities could face between four and seven years in jail for ‘human trafficking’, forcing the charity to seek help from the Spanish government for the first time in its history. Proactiva Open Arms works tirelessly in the Mediterranean, rescuing refugees whose lives are in danger as they seek to reach the shores of Italy and Greece. Crew members were caught with 218 migrants whom they had saved from certain death after their jerry-built craft was cast adrift, and their boat, Open Arms, has been retained in the port of Catania, Sicily. Charity founder Óscar Camps says his priority is to make sure the three crew are not placed under arrest, since they could become stuck on the island for the foreseeable future and may face prison sentences. Camps says Italian authorities have accused the aid workers of ‘facilitating illegal immigration’ as an ‘excuse’ to try to ‘block the intervention of humanitarian work’ in the Mediterranean. Italy and Greece are bearing the bulk of the refugee influx, even more so than Spain – which is the only EU country that shares a land border with the African continent – and attempts by the European Union to resettle war and poverty victims via country quotas have been met with a barrage of opposition from right-wing governments, with the exception of Spain which has taken in over 1,000 and whose society is clamouring for more. “This is the first time in the history of Proactiva Open Arms that we’ve had to call for help from the Spanish government to allow us to drop anchor in an international port,” says Óscar. The Open Arms was out at sea after being intercepted on Sunday and was not allowed into the country until Monday. This was only made possible by Camps’ contacting the Spanish Consul in Sicily and Spanish authorities negotiating with the Italian government to allow the craft to moor in the port of Pozzallo on the island. But the fate of the crew is now in the hands of Italian and Spanish authorities. It has not been revealed whether the refugees were allowed onto dry land.